How Many Of You Have Tried The Chai At These Popular Chai Joints? A wise man once said there is a great deal of poetry and fine sentiment in a chest of tea. And we think this is the absolute truth for Hyderabadis. 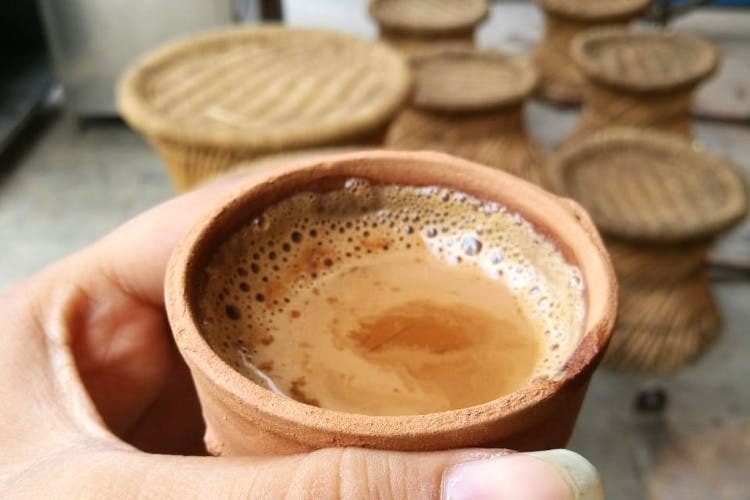 Popular for its chai culture, people who visit Hyderabad never miss a chance to enjoy Irani chai, and if you’re a chai lover yourself, you must be a loyalist to at least one of these chai joints. Haven’t tried a few of them yet? Then let’s get to dunking biscuits and sipping chai now. Located in Lakdikapul, this cafe has gained its name from a popular hospital with the same name in the proximity. Opening its doors at 4.30 am, the show runs till the wee hours of midnight with people rushing in to order the chai which is – kadak – as the Niloufer patriots claim. But what stands out here are the buttery soft Osmania Biscuits that go perfectly well with chai. Be sure to grab a box of them on your way out to savour them at home. At this point, we find ourselves asking – what is Alpha not good at? Whether it’s biryani and kebabs or the Irani chai, the experience at Alpha is a true delight for one’s taste buds. Although it opens at 5 am, we suggest you swing by one evening and try their chai and onion samosa. The chai here is milky, sweet, and thick in consistency, but the tiny samosa can lure even the most diet-conscious peeps. Crispy, hot, delicious – just the perfect guilt trip! This cafe with the view of Charminar attracts crowds from both Old City and modern suburbs of Hyderabad. Known for its Irani chai and Osmania biscuits, we go here for Khopra Biscuits (coconut biscuits) and Shirmal (saffron-flavored traditional flatbread) for kickstarting our mornings. Right from 4 am when it opens, people spill out even on the streets waiting for their chai. Be prepared for having conversations with strangers or step out and sip on your chai with Charminar in your sight. Or if you’re interested in doing more, check out our recommendation on Nimrah here. Brew stories over chai with your squad at Chai Kahani. Popular for its door which we think is Instagrammable, this cafe boasts of food that’s as good as its chai. While you can indulge in some all-day breakfast or omelettes here, we recommend you go for samosa along with Ginger chai or Almond chai, their in-house specialties. And what’s not to love? Their courtyard (Jubilee Hills outlet) covered in canopies of green trees is sure to remind you of good old college days when you’d bunk classes and hang out at the canteen. Dostea is your modern take on traditional chai that serves not just bun maska with tea, but also pizza and French fries. We love this quirky little kiosk for its kulhad waali chai and samosa. This joint has decent varieties of chai like Ginger chai, Kadak chai, Spl. Masala chai (try this if you love your tea a little tangy), Badam Tea, Elaichi Tea etc. Plus, you’ll find stuff worth putting up on Instagram if you go here. Located on the Railway Station road, Blue Sea is a go-to joint for many chai lovers who live in the vicinity. You simply cannot miss out on the luscious Jam Rolls and crunchy samosa here. The Khara Biscuits are priced as low as INR 1 and the Golden Tea (turmeric tea) here is sure to get you hooked on this joint. At the counter, you’ll find items like Tie Biscuit (bow-shaped puff biscuits), Egg Puff, Chicken Puff, Butter Bun, fresh pastries, and Shirmal. We say – take your pick and settle with a cup of Golden chai and savour it. Taiba Bakery in Masab Tank is yet another iconic cafe that tea loyalists hit up for early morning chai and biscuit. The bakery also has a variety of biscuits like Osmania biscuits, fruit biscuits along with chicken rolls, burgers, and sandwiches. Plus, paan lovers should try out the paan here!